The National Disability Mentoring Coalition (NDMC), in partnership with the student-led organization, Disability Rights, Education, Activism and Mentoring (DREAM) at the National Center for College Students with Disabilities (NCCSD), is pleased to announce the establishment of the Dinah F. B. Cohen Fellowship Program to provide college students and recent graduates with disabilities with professional skills and leadership opportunities. To support the Fellowship Program, donate today! Expanded network to impact career development and access to opportunities. The Dinah F.B. Cohen Fellowship Program, based on a joint NDMC/NCSSD fund-raising campaign, will support three Fellows for six month experiences from Fall through Spring. Besides the specific work outlined below, the Fellows will join the NDMC Advisory Committee and DREAM Board, enabling opportunities to share perspectives and ideas directly with NDMC and DREAM leaders and to also learn. Inclusive Practices Fellow: Works with NDMC to define and coordinate activities of the NDMC Inclusive Mentoring Initiative. Promotes inclusive practices in mentoring through the development and provision of content, programming and training for mainstream mentoring programs. Communications Fellow: Coordinates and delivers content to NDMC platforms. Works with the NDMC Communications Committee to develop campaign(s) and content to enhance access to mentoring. Peer Mentoring Fellow: Works with NDMC to define and coordinate activities of the NDMC Peer Mentoring Initiative. Creates platform for ongoing dialogue on the benefits of peer mentoring, sharing best practices and supporting growth in the mentoring model. Each Fellow will also participate in DREAM activities and develop a presentation to be provided to the DREAM Board based on their Fellowship experience, growth and recommendations for moving mentoring forward. The DREAM Fellows at NDMC is named after Dinah F. B. Cohen, former NDMC Member and long-time disability rights leader. As the daughter of holocaust survivors living with a disability, Dinah Cohen dedicated her life to networking, mentoring and guiding the careers of others. When speaking at the Pentagon, President George W. Bush called Dinah an “enthusiastic soul” and thanked her for her leadership in making opportunities available to more people with disabilities. Based on her personal commitment to others and her belief in the power of relationships to bolster individuals in their careers and lives, the fellowship program shall be named the Dinah F. B. Cohen DREAM Fellowship Program. Read a DoD publication on Dinah. 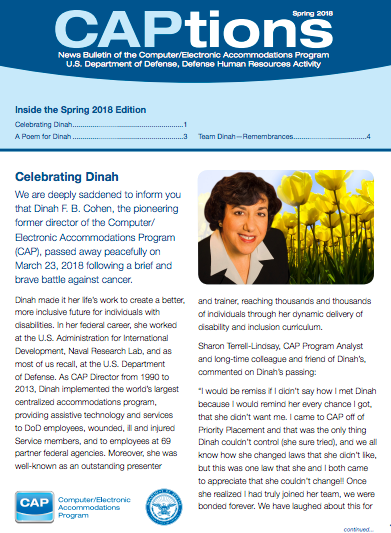 Image of the Spring CAPtions newsletter, “Celebrating Dinah,” with picture of Dinah smiling with field of yellow tulips next to her image. To honor the life and legacy of Dinah F.B. Cohen, the NDMC and DREAM will actively identify and seek applications from young adults with disabilities who represent multiply-marginalized groups. These groups that are adversely affected by the cumulative discrimination against and social exclusion of more than one minority population include, but are not limited to, youth of color and Jewish women with disabilities. Donate Today to Support the Program! Your donation directly supports the Fellowship Program established to honor the life and legacy of Dinah F.B. Cohen, a long-time disability rights leader and former NDMC Member. Donate online here. Established in 2014, the mission of the National Disability Mentoring Coalition (NDMC) is to increase the awareness, quality and impact of mentoring for youth and adults with disabilities in the United States. In its first three years, NDMC created a national network of 60 organizations, launched the Susan M. Daniels Disability Mentoring Hall of Fame, and forged a collaboration with MENTOR: The National Mentoring Partnership to increase inclusive practices in all mentoring programs. In January 2017, NDMC hosted a national Mentoring Roundtable to map out strategic objectives for the mentoring field and for the Coalition. This conversation with over 30 disability and mentoring leaders — representing a diverse, intersectional population — informed the NDMC Strategic Plan for 2017–2018. One of the group’s recommendations for the Coalition was to find an organizational home to ensure continuity of operations and to broaden the impact of its work. The Roundtable also led to the publication of the NDMC White Paper, Mentoring as a Disability Inclusion Strategy. In March 2018, NDMC found its organizational home in Partners for Youth with Disabilities (PYD), a Boston-based non-profit with more than 30 years’ experience delivering mentor match programming and national inclusion training. Being part of PYD enables NDMC to expand its impact through programs such as the Fellowships in partnership with the National Center for College Students with Disabilities (NCCSD), housed at the Association for Higher Education and Disability (AHEAD). The NCCSD hosts the student-led organization, Disability Rights, Education, Activism and Mentoring (DREAM). DREAM was founded in 2011 by three college students with disabilities who led a thread on a national disability-and-higher-education-related listserv calling for networking between students and student-led organizations across the U.S. DREAM is centered on a student-led model with a Coordinator, Student Advisory Board, and Campus Chapters and Affiliates. In the first year of its Campus Chapters and Affiliates program, DREAM leaders have supported the development of 12 new DREAM chapters and 13 affiliates on campuses across the U.S. and receive new inquiries weekly. In addition to developing peer-to-peer communication, support, and interaction, DREAM incorporates disability mentoring informally and formally through national programs such as DREAM Mentor Monday monthly webinars and the Disabled and Proud student-led conference. DREAM is open to higher education students of all types and disabilities and explicitly includes people who have traditionally been marginalized or underrepresented in the disability or higher education communities to lead the organization’s programs and development. DREAM aims to develop disability culture and mentoring on college campuses, advance the study and inclusion of disability issues in higher education, and empower all students with disabilities to create local and national change. NDMC and DREAM believe bringing our two networks together enables us to reach and support college students with disabilities who are looking to develop skills in communications, mentoring, and leadership to apply to careers in public, private, or academic sectors. The Dinah Cohen Fellowship Program will create NDMC DREAM Fellows that also support DREAM objectives to develop skills of DREAM students with disabilities to further the capacity of the DREAM model through campus-based groups and coalitions while removing the gap in inclusive mentoring to ensure all students, young adults and adults with disabilities have access to mentors and can be mentors in communities across the nation. For more information regarding the Fellowship Program, please contact Derek Shields, NDMC Director, dshields@pyd.org.